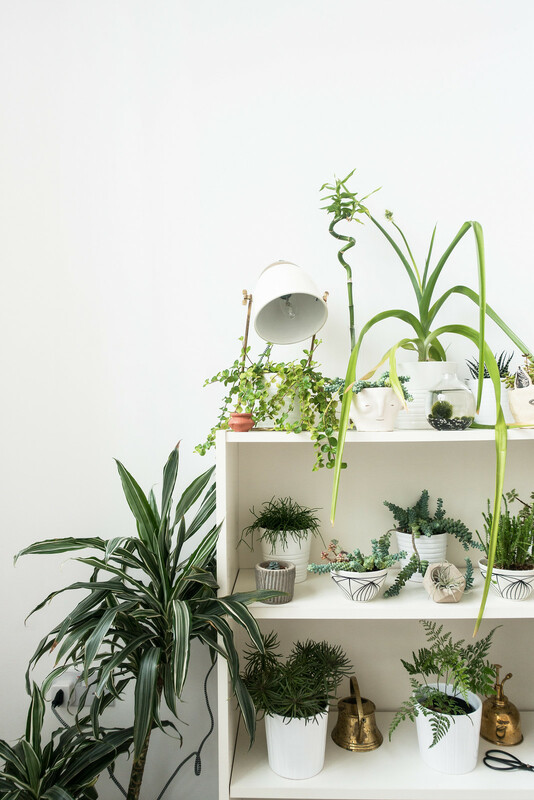 The benefits of bringing plants into your home are far-reaching. Indoor plants help purify the air, boost your mood, influence the style of your home, and are great for your health. But let’s face it, we love plants because they look beautiful in our homes; they can transform a space into a green oasis. 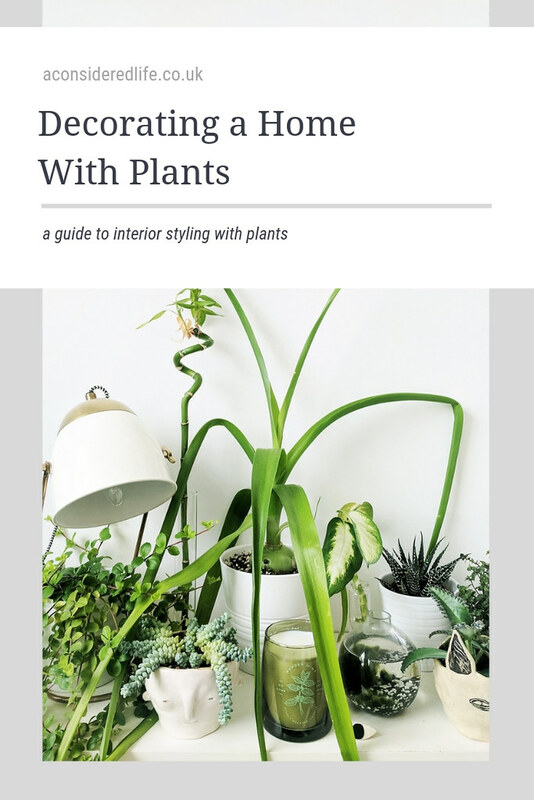 If you’re looking for new ways to decorate, here are a few of the best ways to display indoor plants in your home. You might have a single space shelf or an entire bookcase; whatever space you do have, fill it with plants. You could mix a couple of plants in with your books or dedicate entire shelves to your love of plants. Creating a plant shelf makes a beautiful feature for any room. I decluttered my books until I was left with an empty bookshelf I didn’t know what to do with; I turned it into a plant shelf and now it’s overrun with beautiful foliage. Want to recreate the feeling of a botanical garden in your home? 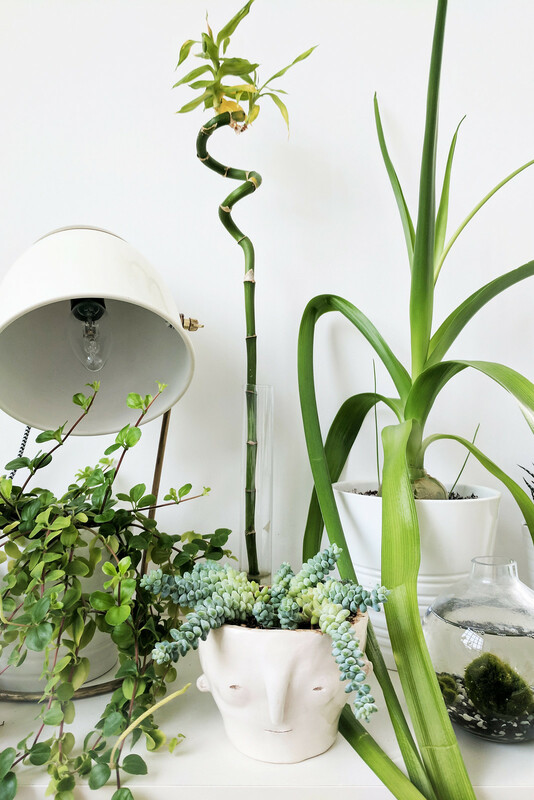 Group your plants together in clusters; make use of side tables, floor space, and sideboards, grouping plants together so their leaves crossover and intertwine - the more the merrier. This works especially well with larger varieties with big leaves that have a tendency to sprawl but this method can work just as well with smaller plants. I make the most of my windowsills, I find it makes caring for them all much easier. One of the best ways you can display plants in your home is to make use of the vertical space. A simple hook in the ceiling, over the edge of a shelf, or window latch can create the perfect spot for a plant to hang. Ceramic planters or macrame hangers are a great way of adding texture and colour to your home. I have a couple of Sass and Belle ceramic planters that hook over our window latches creating the ideal spot for small trailing plants to grow. There’s plenty of little planters in all different styles to choose from; these wall planters are gorgeous. Getting new plants is only the start of something wonderful; getting to pick out the home they live in is just as exciting. Think about colour, texture, shape and style when it comes to picking out decorative planters for your beloved plants. Most of plants are housed in simple white pots but I like to throw a few oddities in the mix. I have small bowls, handmade planters, ceramic hangers, concrete pots, and tea cups. Mixed in with the rest of your plant pots, these decorative planters look curiously interesting. This method is great for any plants you want to propagate. Pick beautiful jars and ornate glasses, ideally with thin necks so the stem can hold the plant upright. It’s a beautiful way of decorating with small clippings and young plants. I have a few decorative jars displaying marimo balls, they always catch guests’ attention and make a curious focal point of any windowsill or shelf. If you’re not keen on putting holes in the walls or you don’t have a spare spot to hang a planter; place trailing plants on windowsills and any ledges in your home. Drape the vines in sweeping loops across the ledge and down the wall creating a beautiful display. The staircase is often overlooked but can be the perfect spot for growing plants. I find windowsills are the ideal location to let trailing plants drape; the vines are free to sprawl and grow without hinderance and they look beautiful against the white walls. Building a terrarium is like growing your own miniature world. Terrariums tend to hold more humidity and produce a jungle-like atmosphere making them more suitable to tropical plants, succulents and cacti. Choosing the right varieties is essential but if you do it right a terrarium is a stunning way to display your indoor plants. I have two glass containers I’m going to turn into terrariums, they make such beautiful displays and I can’t wait to share how I create mine.